Four key changes were made to the Independent Commission Against Corruption Act 1988 in September 2015. 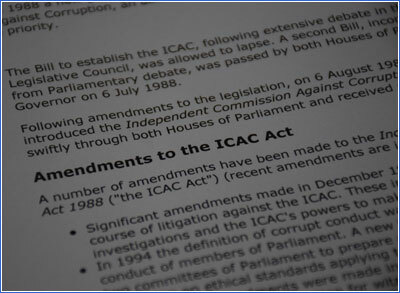 In a few words, the purpose of these amendments is to (1) clarify the definition of corrupt conduct, (2) enhance the ICAC’s corruption prevention functions, (3) give the ICAC a new power to investigate specified criminal offences referred to it by the NSW Electoral Commission, and (4) limit the ICAC’s power to make findings of corrupt conduct to serious corrupt conduct. Why did the NSW Parliament introduce these amendments? How does the new section 8(2A) affect the ICAC’s jurisdiction? Has the ICAC’s corruption prevention function been expanded? Does the ICAC now have the power to conduct investigations into possible criminal offences involving election law? What is serious corrupt conduct? The High Court in ICAC v Cunneen (April 2015) found that, for the conduct of a non-public official to come within the definition of corrupt conduct in section 8(2) of the Independent Commission Against Corruption Act 1988 (“the ICAC Act”), it must be conduct that affects the “probity” as opposed to the “efficacy” of the exercise of official functions. This affected the ICAC’s jurisdiction to investigate the conduct of non-public officials. In May 2015, NSW Premier the Hon Mike Baird MP charged former High Court Chief Justice Murray Gleeson and barrister Bruce McClintock SC to consider and report on the appropriate scope for the ICAC’s jurisdiction; whether the ICAC had appropriate powers and whether any limits should be applied to the exercise of those powers. The report of the Independent Review was released on 30 July 2015. The amendments, in turn, are a direct result of the report’s recommendations. fraudulently obtaining or retaining employment as a public official. Section 8(2A) is expected to increase the number of complaints to be assessed and investigated by the ICAC. The Independent Review noted that the original version of section 13 of the ICAC Act unduly limited the ICAC’s advisory, educational and preventive functions to corrupt conduct. It proposed to “free [these] functions from constraints that accompany the investigative jurisdiction” by adding the function of “promoting the integrity and good repute of public administration” to each of the corruption prevention functions set out in section 13(1)(e) and 13(1)(f). The amendment to section 13 enhances the ICAC’s power to examine wider government and administrative practices that allow corrupt conduct to develop. Yes. In addition to its powers to investigate corrupt conduct, under the new section 13A, the ICAC now has the power to conduct criminal investigations regarding the offences specified in section 13A(9). Before it can do so, the NSW Electoral Commission must first refer the matter to the ICAC. Another new section of the ICAC Act, section 74BA, provides that the ICAC can only make findings of corrupt conduct if the conduct is serious corrupt conduct. The report of the Independent Review states that the term “serious” should not be defined in the ICAC Act. It is not a limit on the ICAC’s jurisdiction and investigation powers. What is serious or not at the corrupt conduct findings stage of an investigation is something that can only be determined by the ICAC. This change only applies to the ICAC’s ability to make corrupt conduct findings. It does not affect the ICAC’s jurisdiction. If a matter comes within the definition of corrupt conduct in the ICAC Act, then the matter can still be reported to the ICAC and the ICAC can still investigate, even if the ICAC ultimately determines that the conduct is not sufficiently serious to make a corrupt conduct finding. If you are not sure whether a matter comes within the definition of corrupt conduct in the ICAC Act, you can contact the ICAC. Members of the public, public officials and principal officers of public sector agencies should continue to notify the ICAC of suspected corrupt conduct in the usual way; that is, online on the ICAC website or by letter, telephone, fax or email using the details below. The ICAC also accepts enquiries and reports in person at its premises located at 255 Elizabeth Street, Sydney.